Place wet sprouts in loosely covered microwave-safe bowl or bag and microwave on high for two minutes to blanch. Remove from microwave and allow to cool. Line a microwave-safe plate with four paper towels. Cut bacon strips in half, crosswise, and place in a single layer on top of paper towels on plate. Depending on size of plate/microwave, you may have to do this in two batches. Cover with another paper towel. Microwave on high for approximately three minutes or until bacon is partially cooked yet still very pliable and far from crispy (exact time depends of your microwave and the thickness of your bacon). Using a small paring knife, cut an “X” in the top of each sprout, cutting two-thirds of the way down through the sprout so that the stem end is still intact. Stir herbed cheese to soften and put in resealable plastic bag. Seal bag and snip off the tip of one of the bottom corners of the bag to create a disposable pastry bag. Insert tip of bag down into the “X” in sprout and gently squeeze to fill sprout with a bit of the cheese. Repeat with all sprouts. 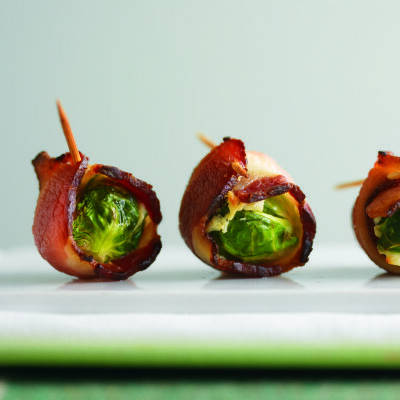 Wrap spouts with bacon, covering cheese-filled “X” and secure with toothpicks. Arrange sprouts scored side up (stem-side down) on wire rack on rimmed cookie sheet. Bake until bacon is crisp, about 25 minutes.